Eliza Kate Wicks-Arshack directs our Outdoor Education department. Eliza is responsible for course directing and facilitating the wilderness orientation course each trimester, overseeing risk management of outdoor experiences, managing and supporting outdoor education staff, maintaining our Association for Experiential Education (AEE) accreditation, developing and implementing curriculum to improve outdoor education at Eagle Rock and beyond, and supporting students throughout their journey at ERS. Eliza, originally from New York City, developed a passion for wilderness travel as a little girl exploring with her family and canoe tripping. Her passion for inclusive and alternative education was fostered from her experience in the public school system in New York. 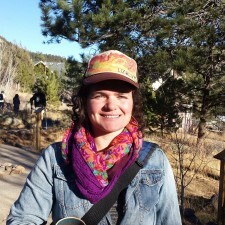 After leaving NY, Eliza earned her bachelor’s degree at Colorado College where she studied Sociology and ran their outdoor leader training program. Eliza first joined the ER team in January of 2012 as a wilderness instructor and subsequently served as the Public Allies Fellow in Outdoor Education at ER in 2012-2013. She has worked for several wilderness therapy and outdoor education programs leading up to 48-day wilderness courses. Eliza is a Wilderness Emergency Medical Technician (WEMT), Single Pitch Instructor (SPI) for rock climbing, holds an AIARE I avalanche safety certification, as well as a Swift Water Rescue certification. She is an avid outdoors-woman, cook, and crafter. My favorite thing about Eagle Rock is that I learn and grow as much as our students are challenged to.